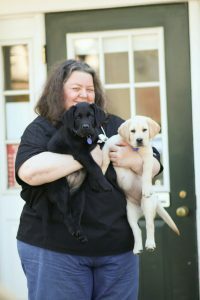 Founded in 2016, The Exceptional Sidekick Service Dogs in Newtown, CT, aims to transform lives by partnering exceptional psychiatric service dogs with children and adults with psychiatric disabilities, free of charge. Our program brings together school communities who work cooperatively to raise and train the dogs as well as educate their peers about psychiatric challenges. Through wonderful volunteers, The Exceptional Sidekick Service Dogs matches each dog with a school community for the next year and a half of training. During that time the dogs live in the teacher’s home and follows the teacher’s daily routine in school. This serves three purposes. First, the dog is being socialized and trained continually. Second, research shows that having a dog in the classroom, even without direct physical contact, can promote positive social interaction, increase concentration, and reduce stress and anxiety. Third, students learn about the dog’s purpose of serving someone with a psychiatric disability, and are educated about the needs of people struggling with mental illness. The Exceptional Sidekick Service Dogs launched a Teen Trainer Program at Newtown High School which was the foundation to furthering community support and education. A group of students identified by school counselors are assigned to the dogs at intervals throughout the school day, and have the opportunity to train them. Students will also be required to participate in workshops about brain health. Once the teen volunteers have completed their training they will then be offering peer support within their school community. Founded by leading dog behavior expert and trainer Abby Hill, The Exceptional Sidekick Service Dogs is the only non-profit organization in the area that offers psychiatric service animals to civilians or children. Abby is determined to raise the best possible psychiatric service dogs and place them free of charge to children and adults in need. The Exceptional Sidekick Service Dogs and Therapy Dogs is a 501(c)(3) non-profit organization that depends solely on donations to operate. The cost of adopting, raising, training and providing proper healthcare for these dogs for the first two years of their life prior to placement is approximately $30,000 per dog. Please help our mission with a contribution today. Abby is a Certified Professional Dog Trainer (CPDT-KA) through the Certification Council of Professional Dog Trainers (CCPDT). She has competed on a National Level in multiple disciplines including AKC Rally and Obedience. Abby is the owner of The Exceptional Pet, as well as the Founder and Director of The Exceptional Sidekick Service Dogs and Therapy Dogs. She is also an AKC Canine Good Citizen Evaluator and a Member of the National Association of Canine Scent Work. Lauren Wolfe is Licensed Professional Counselor who works with children and families. For more than 10 years Lauren has been helping children and teens with anxiety, social difficulties, Asperger’s Disorder, Attention-Deficit Hyperactivity Disorder, eating disorders, trauma and grief. She also is a parenting expert and utilizes the STEPS parenting program, as well as individualized support. Lauren incorporates individual and family counseling with clients. She utilizes Cognitive Behavioral Therapy, Play Therapy, Art Therapy, Internal Family Systems Therapy, Neurofeedback, Emotional Freedom Technique (EFT/ Tapping) and Yoga. Lauren’s gentle, non-judgmental manner puts children and families at ease. She also works with very young children, adolescents and adults. Lauren is honored to work with individuals and families as they heal and grow. Training is our number one expense and The Exceptional Pet and all of their trainers have donated their time and facility to training our dogs and educating our puppy raisers. Each one of our dogs goes to a weekly group class as well as having consistent private public access lessons. In the first two years of The Exceptional Sidekick, The Exceptional Pet and their trainers have donated over $50,000 in training and equipment. The staff and doctors practice the highest quality medicine and surgery with compassion, and are devoted to taking care of the medical needs of our dogs in training at cost. Bethel Village Square Animal Hospital has, from day one, given our dogs complete veterinary care at cost to them. Dr. Paulin and Dr. Powers offered their services without hesitation and that has allowed us to put our funds towards purchasing new dogs and equipment. They have been an integral part of our success and we can not thank them enough for keeping our dogs healthy.